The river at St. Olaves is straddled by a road bridge with moorings available at the public staithe or outside the Bell Inn public house, reputed to be the oldest on the Norfolk Broads. The public staithe offers side on moorings with a short walk to the Bell Inn. The moorings at the public house are stern-on. The tide runs fast here so care must be taken when mooring. Always come in against the prevailing tide so that the current slows you down. Mooring with the tide should always be avoided as you will come in too fast and will lose control of your boat. Things to do: Visit the ruined St Olaves Priory, built in the 14th century and housing a well preserved refectory under-croft. The under-croft is noted for its vaulted brick ceiling, one of the earliest uses of brick in the country. The Priory is to be found in the grounds of the Priory Farm Restaurant. Eating and Drinking: The Bell Inn is a large establishment on the banks of the River Waveney, right next to the old road bridge. It offers and extensive menu of main meals and lite bites such as sandwiches, baguettes and jacket potatoes. Cooked breakfasts are also available between 9 and 11am for those who don't want to cook on a morning. The Priory Farm Restaurant is a large well thought of concern where advance booking is recommended. The menu is large including speciality steaks, fish and traditional home cooked favourites. The Priory is a short walk up from the Bell Inn on the opposite side of the road. Lamas, goats and sheep can be seen in the grounds leading up to the restaurant. Other Services: There are no shops in St Olaves. 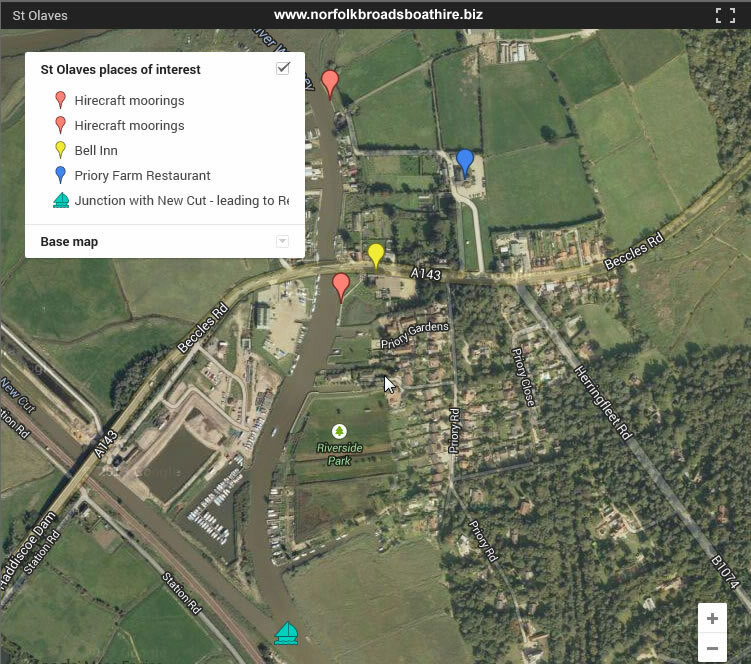 TIP: The public staithe moorings are a short walk from the main road and the Bell Inn but you are less likely to be disturbed at night by road traffic.